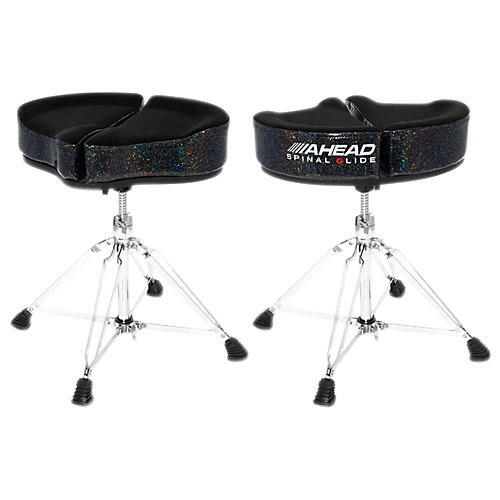 Open Box Ahead Spinal G Drum Throne Black Cloth Top and Black Sparkle Sides 18 in. Ahead's Spinal G drum thrones have been developed for players who require the higher level of support and comfort an ergokinetic throne provides. Ergokinetics is a term invented and trademarked by Doctor of Chiropractic and designer of the Spinal G throne, Richard Robertshaw. This science focuses on the integration of design and support of the human body in motion, whereas ergonomics studies the integration of design to support the human body at rest.